In a scathing letter to Union finance minister Jaitley, former BJP chief minister of Gujarat, Suresh Mehta, has said that Jaitley’s recent outpourings (click HERE) against thejudiciary is the direct result of what he calls BJP’s “flamboyant Rajya Sabha MP” Subramaniam Swamy’s attacks on him. Recalling how Swamy recently alleged in a recent TV interview that Jaitley was trying to “undermine the investigation into AugustaWesland chopper scam” amidst reports that Swamy may be replaced as India’s finance minister, Mehta tells Jaitley, “I wonder if you are feeling nervous." 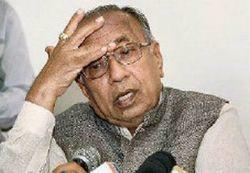 Mehta – who became compromise Gujarat chief minister in October 1995 following a rebellion against the then chief minister Keshubhai Patel, led by current Congress leader Shankarsinh Vaghela and reportedly engineered by Narendra Modi – resigned from the BJP in December 2007. Providing instances, Mehta says, its first indication was in April 2015, when the Prime Minister told a joint conference of Chief Ministers and Chief Justices of High Courts that India’s courts “need to be cautious against perception-driven verdicts", accusing “five star activists" of being the resource persons for providing material for such verdicts. “Modi’s statement on ‘perception-driven verdict’ came just around the time when clean chit was sought to be given to BJP president Amit Shah, one of the prime accused in two of the most notorious fake encounter cases of Gujarat -- Sohrabuddin Shaikh and Ishrat Jahan”, Mehta says. “The whole effort of the Prime Minister was to drive home the point that the judiciary should not go by the ‘perception’ supposedly held by activists that a criminal politician, who acts behind the scene, is responsible for crimes committed on the ground”, Mehta says. “Clearly, the government appears not very keen to allow smooth functioning of the Supreme Court collegium, which has the powers to appoint judges. In fact, it wants to have a say in recommending names of candidates, insisting that the Memorandum of Procedure (MoP) for appointing judges”, Mehta says, referring to recent reports on government’s suggestions for MoP.